Hello! I'm Lena and I live in Moscow! I am 45 years old. I keep an active and healthy lifestyle. I’m keen on sport and I’ve been running for long distances for four years so far. To your surprise, I’ve already taken part in 3 marathons, the Moscow Marathon, Paris Marathon, as well as the Berlin Marathon! And now my new goal and challenge is to participate in all the top six world marathons that are included in the World Marathon Majors. I ran in one of them on September 24th , 2017 in Berlin and I managed to show a significant achievement - my personal result was 3 hours and 42 minutes. It was gorgeous! I was very proud of myself. In fact, we go running with my husband. But as opposed to me, he does not set a goal to improve the result with each next marathon, he just enjoys running and sharing my interests! To tell the truth, my hobby involved me into another important sphere – I got interested in nutrition before and after training. And as a result, I took a healthy nutrition course and became a Nutritionologist. And now I help people who are over weight. I help to change eating habits, correct diets and support people to keep fit! 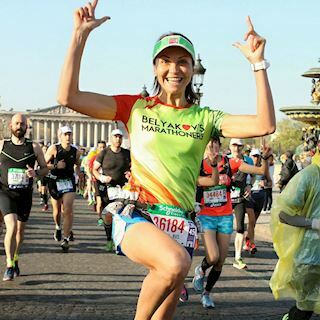 I am pleased to be a part of the Worlds Marathons and to show by my own experiences that it's never too late to go in for sports and be a healthy and happy person !!! Did you enjoy reading about Lena? You can connect with her on Instagram. If you would like your runner story to featured as well, kindly drop us an email at zen@worldsmarathons.com, and we will be in touch to get you all set-up!